All of Earth and Middle Earth paid close attention to the previously obscure South Island of New Zealand, where the shooting of The Hobbit: An Unexpected Journey took place in 2011. Sightings of stars arriving and departing the various locales used for shoots were eagerly reported across the globe. Millions watched the trailer that was released last December promoting The Hobbit. Anticipation continued to build this year as Kiwi director Peter Jackson and his eager band at Weta Digital assembled the final cut of the film. That was bound to happen when the prequel to The Lord of the Rings trilogy was being made. After all, the trilogy only grossed $2.924 billion worldwide, winning a slew of Oscars (and all sorts of other awards) along the way. It’s safe to say that this is one film that didn’t need a festival premiere—or, indeed, a premiere in London or New York or Hollywood. In fact, The Hobbit premiered in Peter Jackson’s hometown of Wellington, New Zealand last week and will be released today in many continents on Earth (and in other places in Middle Earth, no doubt). 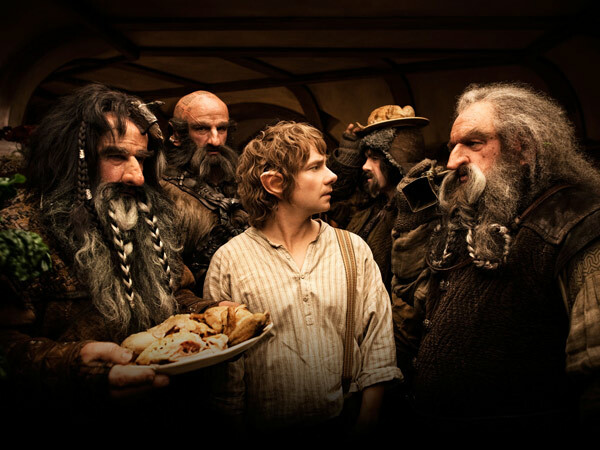 Bilbo Baggins, a quiet home loving hobbit, is tricked by the great wizard Gandalf into hosting a dinner party for Thorin and his band of twelve dwarfs. At dinner’s end, Gandalf and Thorin unroll a map and tell Bilbo of their quest to ascend to their ancestral home on Lonely Mountain and conquer the dragon Smaug who had deposed Thorin’s imperial grandfather. Legend has it that there’s a key, which unlocks an invisible door, and will allow the dwarfs a secret entrance into the Mountain. It’s Gandalf’s plan that Bilbo will be the burglar who steals the key that will open the door. Initially reluctant, Bllbo joins the band the next day, setting him off on an “unexpected journey” of epic proportions. As Bilbo, Gandalf, Thorin and his dwarfs make their way through Middle Earth, they’re aware of danger from their sworn enemies, the Orks, as well as others—notably, trolls and goblins. When they encounter trolls, the dwarfs and Bilbo nearly become their dinner before Gandalf arrives to save the day. Chased by Orks after escaping the trolls, the dwarfs are taken into the beautiful Elf country of Rivendell. There, Elrond, the King of the Elves reveals secrets of the map to Thorin. The dwarfs’ quest to return home and revive their empire is discussed with much foreboding by the powerful mystics Elrond, Gandalf, Saruman and Galadriel. Before anything can happen in Rivendell to stop them, Thorin and his band escape to the Misty Mountains, where they’re captured by goblins—all except for Bilbo. In the caves of the Misty Mountains, Bilbo finds a mysterious golden ring. Soon, he encounters Gollum, who threatens his life, while playing a game of riddles. In a tense, eerie scene, Bilbo realizes that the ring belongs to Gollum but he keeps it—and wins the game. Meanwhile, Gandalf saves the dwarfs from the goblins and Bilbo rejoins them—just in time for the Orks to attack in force. All seems lost until the powerful sorcery of Galadriel saves them. And the quest will continue—in part two, due out next Christmas.